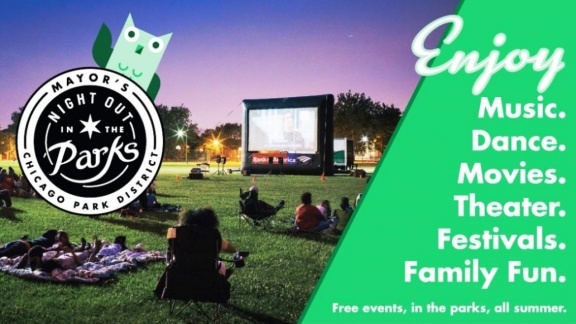 Mayor Rahm Emanuel and Chicago Park District Superintendent and CEO Michael P. Kelly, together with local arts organizations, performers and community members, announced the sixth summer season of Night Out in the Parks at Homan Square Park. 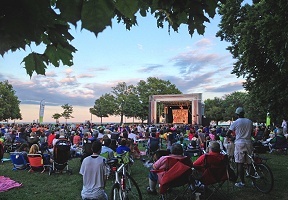 The 2018 Night Out in the Parks series will bring over 1,200 world-class events, including over 230 movies, 102 dance showcases, 301 concerts and 184 theater performances, to every one of the city’s 77 community areas. This year the Park District is partnering with 40 new artists and cultural organizations. Among them is poet and performer Harold Green. Green’s contribution to Night Out in the Parks is Flowers for the Living, a thoughtful spoken word performance and collaboration project with 20 of Chicago’s most talented singers, an eight-piece band and visual artists. The interactive concert series, spearheaded by the celebrated poet and motivational speaker, will be held at 63rd Beach on August 17, Hamilton Park on August 24, at Garfield Park Conservatory on August 29, and at Columbus Park Refectory on September 7. The full list of programming is on The Night Out mobile application My Chi Parks™, available to download on Apple and Android devices, makes planning exciting and affordable summer outings an easy undertaking. More information can also be found by visiting www.nightoutintheparks.com or call 312.742.PLAY.